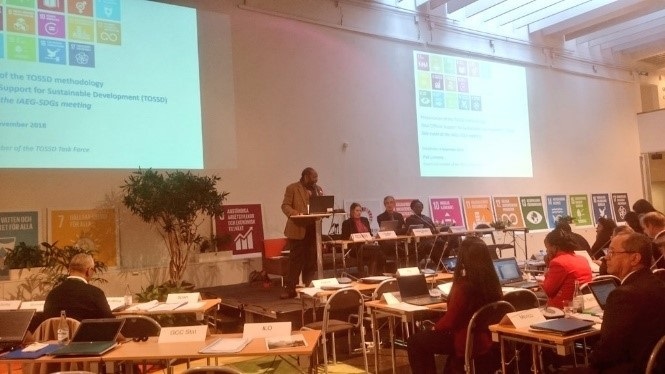 SESRIC attended the Sixth Meeting of the Total Official Support for Sustainable Development (TOSSD) Task Force which was organized by the Development Co-operation Directorate (DCD) of the Organisation for Economic Co-operation and Development (OECD) in collaboration with the Swedish International Development Agency (SIDA) on 5-8 November 2018 in Stockholm, Sweden. The Meeting mainly aimed to finalise the emerging Reporting Instructions for Pillar I; advance work on Pillar II by focusing on the eligibility criteria and two specific themes (research, peace and security); prepare for a pilot data collection and discuss data use (e.g. inclusion of the TOSSD methodology in the SDG global monitoring framework); and discuss the future governance and possible ways to anchor TOSSD in the UN. Being the Member of the TOSSD Task Force since its establishment, SESRIC contributes to the work of the Task Force for building a robust framework how development finance is extended in the SDG era, including Islamic Finance. SESRIC first proposed the modification of the OECD-DAC Taxonomy of Financial Instruments to accommodate more Islamic Finance instruments as they are used by the member countries of the Organisation of Islamic Cooperation (OIC) for financing the development cooperation among each other. In the next version of the Reporting Instructions, Islamic finance instruments are considered to be included in the financing arrangements under main statistical concepts of the TOSSD framework. As the Meeting was held on the same date and venue with the eighth meeting of the Inter-agency and Expert Group on Sustainable Development Goal Indicators (IAEG-SDGs), TOSSD Task Force members had the opprotunity to interact with IAEG-SDG members and raised awareness about the relevance of the TOSSD methodology to the SDG global monitoring framework.